Play all your favorite videos and music on your iPad, you may try this mediAvatar iPad Video Converter for Mac if you work on Mac OS X. Convert nearly any HD and SD video formats such as AVCHD (*.mts, *.m2ts), H.264/MPEG-4 AVC, AVI, MPEG, WMV, DivX, MP4, MOV, RM, RMVB, ASF and 3GP to 720p H.264 HD or H.264 & MPEG4 & MOV formats, or extract audio from video to iPad music or convert audio formats (MP2, WMA, RA, AC3, OGG, APE, CDA, etc.) to iPad audios. Trim or split a video into segments, convert a video to iPad video and music files at one time, set various parameters to get the best effect you want, take all your favorite movies and music with your iPad! 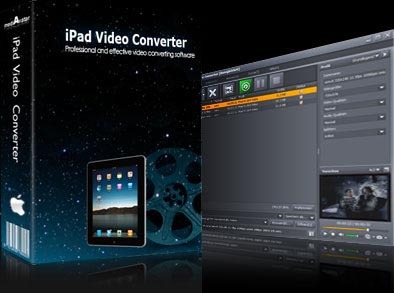 Download mediAvatar iPad Video Converter Mac for FREE now, and enjoy the gorgeous movies on your iPad! Convert AVCHD (*.mts, *.m2ts), H.264/MPEG-4 AVC, MPEG-2 HD, MPEG-4 TS HD, MPEG-2 TS HD, Quick Time HD, WMV HD, AVI HD and other HD videos to iPad movies in H.264 HD (720p), H.264 or MPEG4 or MOV format on Mac. Convert common video formats (incl. MPEG, WMV, DivX, MP4, MOV, RM, ASF, 3GP, AVI, etc.) to iPad videos (H.264, MPEG4, MOV); extract audio from videos and convert to iPad music. Convert audio formats (incl. MP2, WMA, RA, AC3, OGG, APE, CUE, etc.) or rip audio CDs to iPad music in MP3, AAC, WAV, AIFF formats on Mac OS X. Load a batch of files and convert them to iPad videos and music at one time. All iPad video and audio profiles are optimized in parameters to make them fit iPad most, enabling you to choose the one you want directly without any extra settings! If not satisfied with the profile, you can adjust its output parameters (such as bit rate, frame rate, sample rate, channel, codec, aspect ratio and so on) freely and if necessary, save the modified parameters as a new profile. Any video/audio clip can be extracted and converted to iPad video or music simply by setting its start time and duration. Preset a split mode to split a file into several clips by fixed time or duration. Set multiple output formats for a single file and convert them simultaneously to iPad videos and music. Adjust the output file size freely by entering the size you want in the Bitrate Calculator which will compute the corresponding video bit rate. Available in five language interfaces: English, German, French, Spanish and Italian. Convert and transfer videos/music to iPad; backup iPad videos/music to Mac.